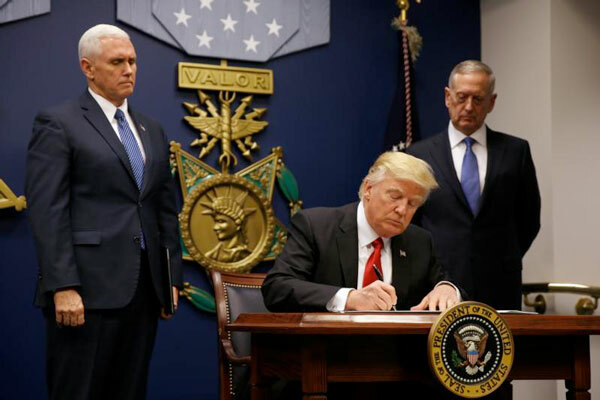 WASHINGTON (CNS) – Within hours of President Donald Trump’s new executive order March 6 banning refugees from six majority-Muslim nations, Catholic and other religious groups joined secular leaders in questioning the wisdom of such a move, with others vowing to oppose it outright. “At the heart of the work of Catholic Charities is the Gospel mandate to welcome the stranger and care for the most vulnerable among us,” said Dominican Sister Donna Markham, president and CEO of Catholic Charities USA. The revised order replaces Trump’s Jan. 27 order, which has been blocked in the courts. The new order imposes a 90-day ban on issuing visas to people from six predominantly Muslim nations; Iraq is no longer on the list. The countries are Iran, Libya, Somalia, Syria, Sudan and Yemen. It suspends the U.S. refugee program for all countries for 120 days. It also excludes lawful permanent residents – green card holders – from any travel ban. The new order will not take effect until March 16. Bishop Joe S. Vasquez of Austin, Texas, chairman of the U.S. bishops’ Committee on Migration, said Trump’s new order still puts vulnerable populations at risk. “We must always remember that we are a nation of immigrants and refugees and we are called to stand in solidarity with them,” he said.